Have you decided to bring a guinea pig into your home? As pets go they are quite easy to care for, but there are still a few essential items you’ll need in order to ensure their health and happiness. If you’re planning to buy your guinea pig in a pet store, you’ll most likely be able to buy most of the following items when you pick up your new pet. If you’re adopting your guinea pig from a shelter (something I highly recommend), it’s best to have all these things on hand before bringing your new furry companion home with you. 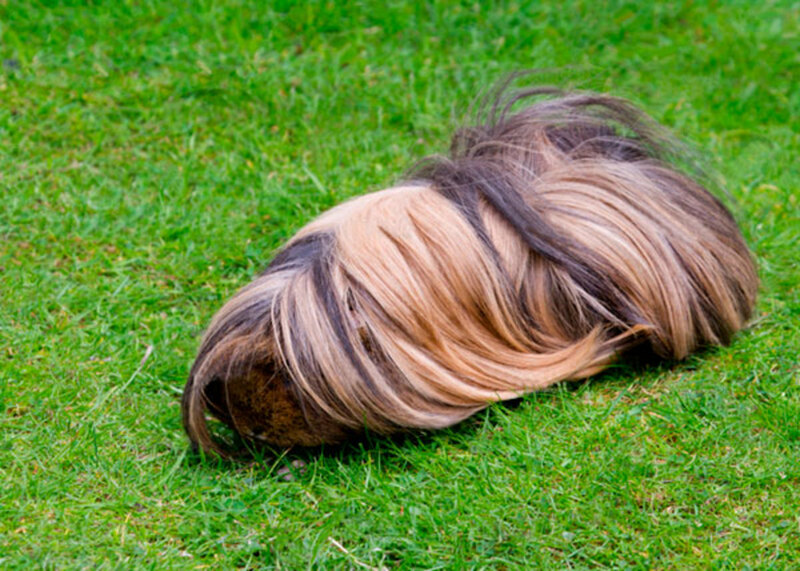 There are guinea pig owners who allow their pets to roam freely in their homes, but that simply isn’t a practical option for most people. Therefore, finding a high-quality cage is the first step in preparing for the arrival of your new pet. Cages come in quite a few different varieties, but the most important consideration in selecting a cage is size. Guinea pigs need a lot of space. 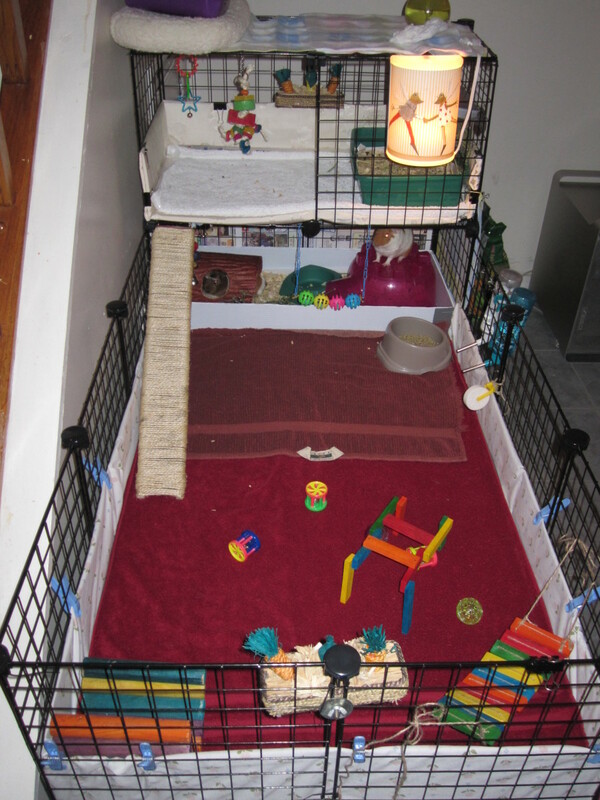 Even if you are able to let your piggies play on the floor, their cage needs to be large enough to allow them to run and play. You should try to have at least 7.5 sq. ft. of space for one guinea pig and 10.5 sq. ft. for two, but bigger is generally better when it comes to cages. It’s best to give your new pets the largest home you can accommodate. 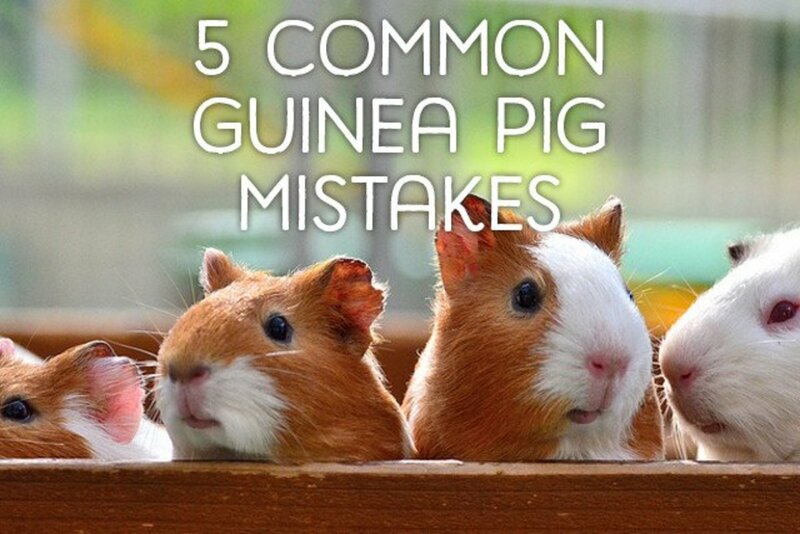 For this reason, it’s important to be cautious when considering “Guinea Pig Starter Kits” that include a cage and a variety of other accessories. They might seem convenient, but the cages included in these kits are often far too small, even if you only intend to house a single guinea pig. The same can also be said for stand-alone cages labeled as suitable for guinea pigs. Don’t just take the manufacturer’s word when they say that a cage is appropriate; always check a cage’s measurements before buying. In terms of actual construction, there are two things to look for in a cage. The tops must be open, as in there is space between the bars to permit easy air flow, and the bottom needs to be solid. It doesn’t matter that much whether the base of your cage is made of metal or plastic, but it absolutely must not be wire. Wire can hurt guinea pig feet and lead to injuries. When it comes to providing water for your pet, you have two basic options. The simplest method is to fill a heavy, yet shallow bowl or ramekin with water and place it in an easy-to-access spot in your guinea pig’s cage. This is typically the cheapest alternative, particularly since you might be able to use a bowl you already own, and cleaning is extremely easy either by hand or in the dishwasher. Using a water bowl does, however, have some drawbacks. Because they are completely uncovered, water bowls tend to collect the shavings, hay, and waste kicked up by normal guinea pig play. They can also be easily tipped over by mischievous guinea pigs, making it hard to track water consumption and potentially leaving your pets without water should the bowl be tipped over while no one is home. 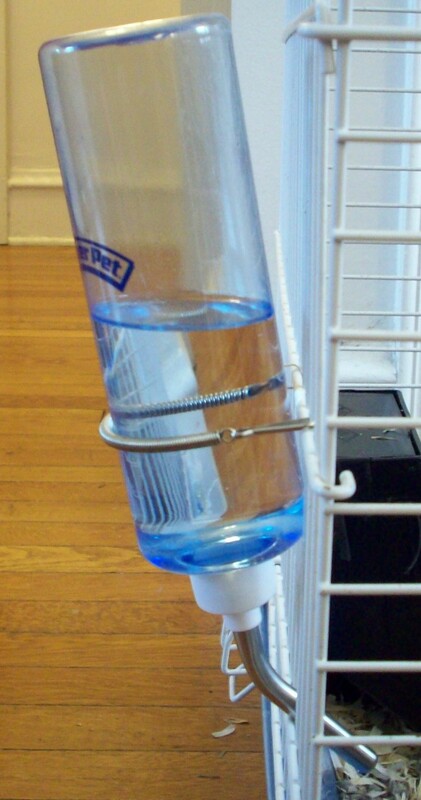 Consequently, many guinea pig owners, including myself, prefer to use water bottles. Available in both glass and plastic, these are designed to hang on the side of your cage and provide water access via a metal spout. The spout contains ball bearings that prevent water from flowing unless they are actively moved out of the way by your pet. This mechanism allows you to easily monitor your pet’s drinking habits and eliminates the problem of spilling. Water bottles also maximize play area since they are up off the floor. Water bottles are more expensive than water bowls, though usually not by more than a few dollars, and require slightly more work to clean. Most are not dishwasher safe and, depending on the model, washing the spout can be a little tricky. Regardless of what kind of water holder you choose, just make sure to consider the number of guinea pigs you plan to house when making a purchase. 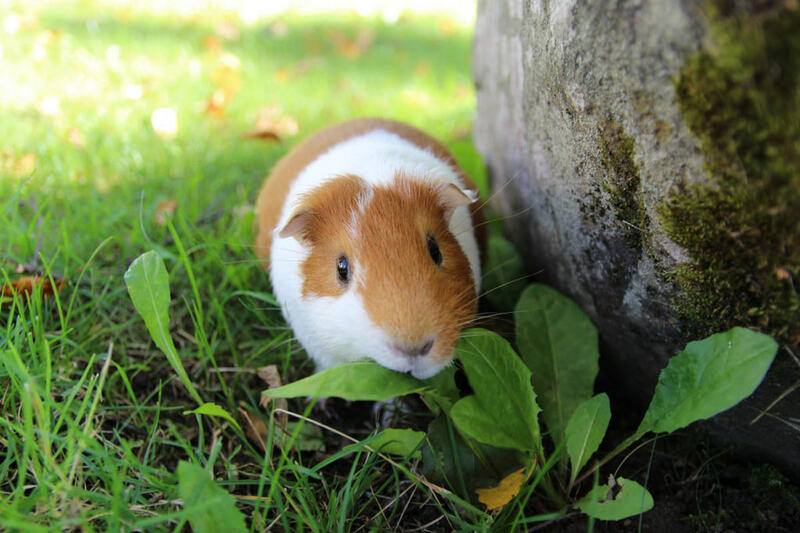 The options for storing your guinea pig's food are similar to those available for water. You can use a bowl, either specifically designed for small animals or from your existing collection of dishes. Because guinea pig food is dry and won’t be absorbed by cage debris, contamination is less of an issue, though, of course, it still does happen. Tipping can still be a problem, however, especially if you have a larger guinea pig enjoys a good game of topple the cage accessory. 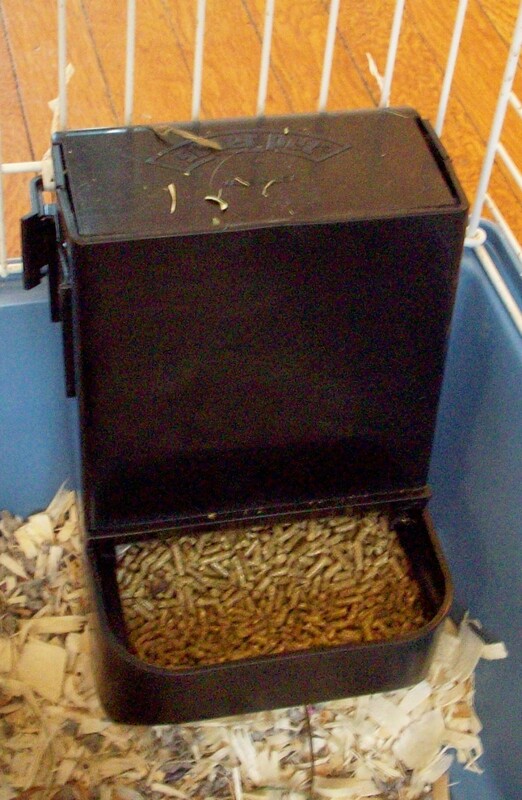 Another alternative is to use a feeder or bowl that can be attached to the side of the cage. These are typically more expensive than free-standing bowls, but they prevent spillage and food loss which will most likely save you money in the long run. If you plan to house multiple guinea pigs these can also be a good choice as they are available in larger sizes. Guinea pigs are prey animals. 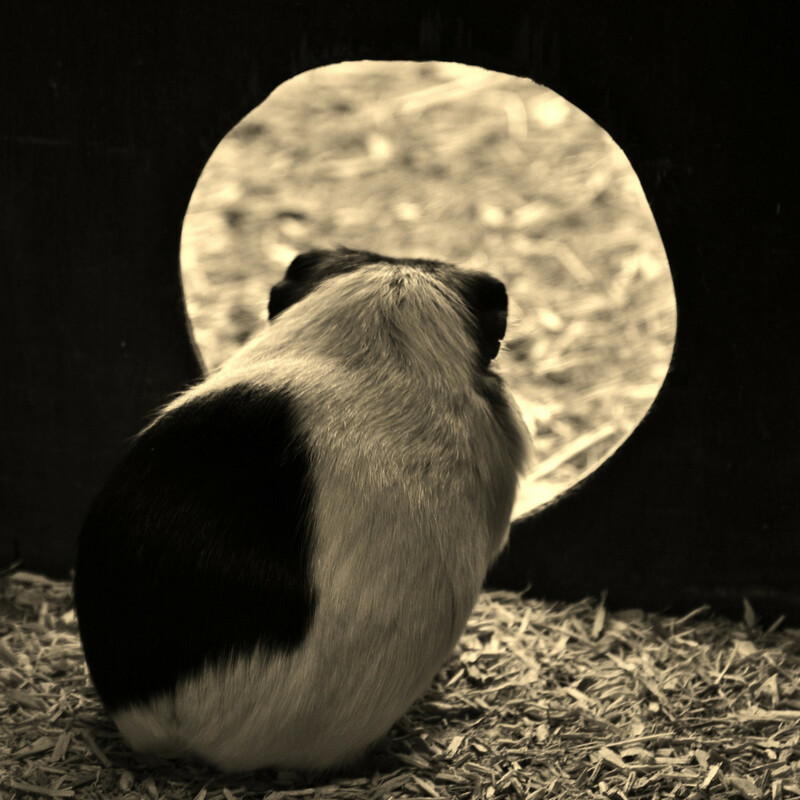 When frightened or startled – a frequent occurrence with most piggies – their natural instinct is to retreat into dark, enclosed spaces. It’s therefore important to provide your guinea pig with some sort of covered shelter. This shelter can take the form of anything from a cardboard box with the bottom and one or two sides removed to a hutch specifically designed for small animals. If you intend to buy a hutch, you have two options: one made of plastic or one made of edible materials. 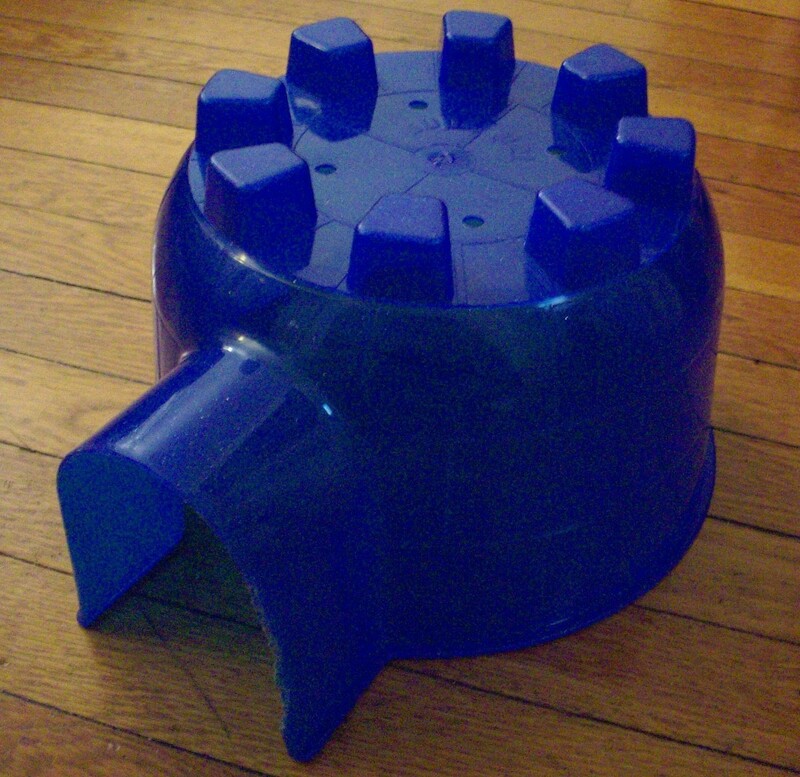 Plastic models are inexpensive, durable, and easy to clean. Hutches designed to be consumed can be slightly more expensive and, for obvious reasons, need to be replaced more often. 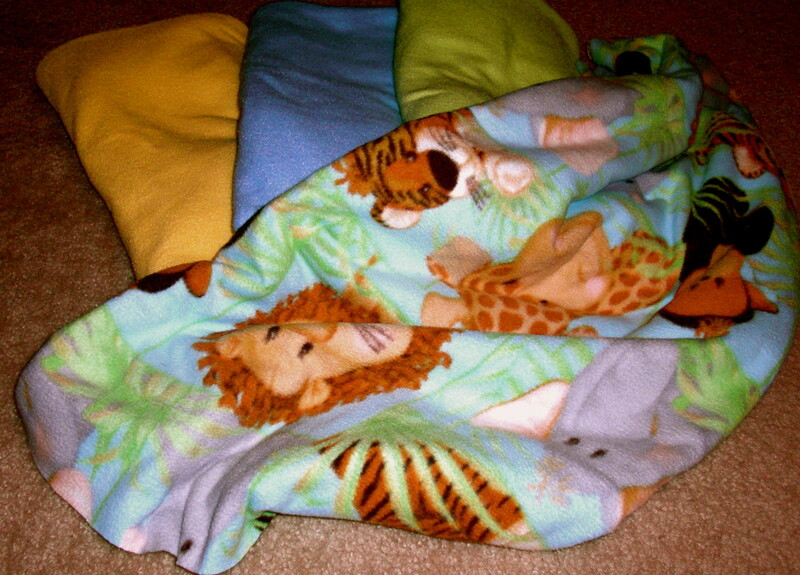 They also aren’t washable, as they are usually made from things like hay and twigs. However, they can offer peace of mind if you’re concerned about your pet eating bits of plastic. I have used both varieties and, while I tend to prefer edible models because they provide another way for my guinea pigs to satisfy their chewing needs, have never experienced any problems with plastic hutches. Regardless of what type of hutch you choose, make sure that it is big enough to comfortably fit all of your guinea pigs. Also, try to get one without a bottom; a bottom doesn’t really serve any purpose and just has a tendency to get soiled by waste. There are two kinds of bedding appropriate for use in guinea pig cages. The least expensive and probably most common is wood shavings. Shavings are fairly absorbent, easy to find, and safe for use in most circumstances as long as they are made of Aspen. They can, however, be uncomfortable for older guinea pigs or those suffering from foot problems. For that reason vets often recommend soft bedding made from cellulose fibers or recycled paper products. These can be gentler on your pet’s feet and are typically better at absorbing odors and waste. The trade off is the cost; regardless of brand, this kind of bedding is almost always going to be more expensive than shavings. If you’re looking for a blend of economy and efficiency, a good option is to use a mixture of both types. 1. Type: Guinea pigs should only be fed pellets specifically created for guinea pigs. Guinea pigs may share many similarities with rabbits and other small rodents, but their nutritional needs are not the same. Giving them food created for other animals, even if they are also rodents, could cause serious health problems. 2. Contents: Hay should be the primary ingredient in your guinea pig’s food and it should not contain nuts, seeds, or dried fruit and vegetable pieces. These extras can encourage selective eating, meaning that your pet may choose to eat what they find most appealing rather than what is good for them. This can lead to nutritional deficiencies as well as weight problems. Just think about what would happen if you were to choose what you ate based solely on what you liked best! Please Note: Guinea pigs should not be given nuts or seeds even as an occasional treat. They’re not part of their natural diet and contain too much fat and protein. The shell fragments from seeds also pose a serious choking hazard. 3. 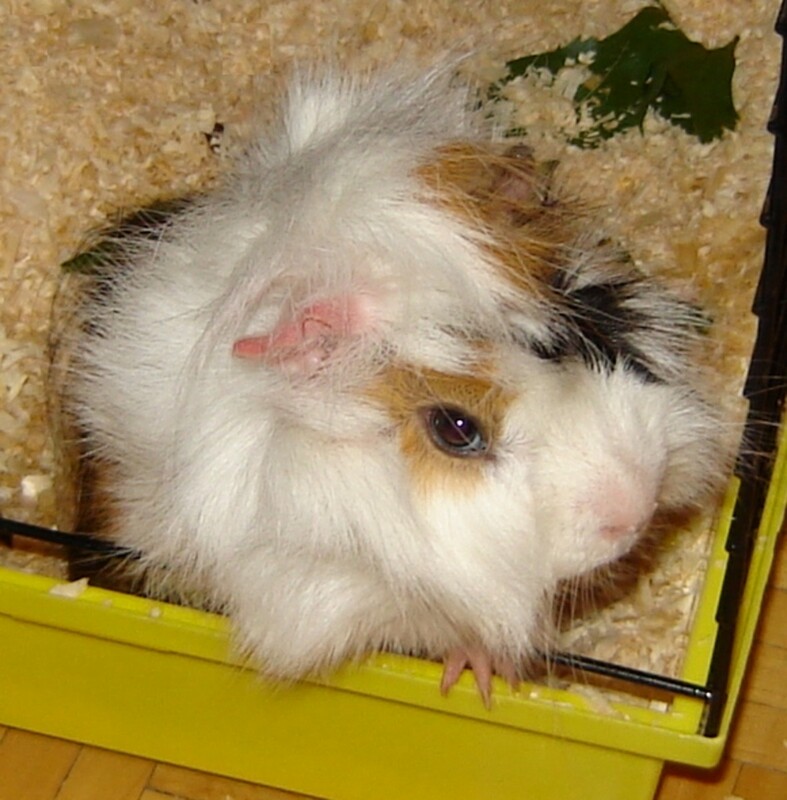 Guinea Pig Age: Young guinea pigs have different nutritional needs than mature adults. Piggies under a year old need food with a higher protein and energy content and should be fed alfalfa-based pellets. Adults should be given pellets made with Timothy hay. If you’re not certain how old your guinea pig is – a definite possibility if you choose to adopt – you should ask your vet. Hay is an essential part of a guinea pig’s diet and should be made available at all times. In general, Timothy hay is the best variety to give your guinea pig. 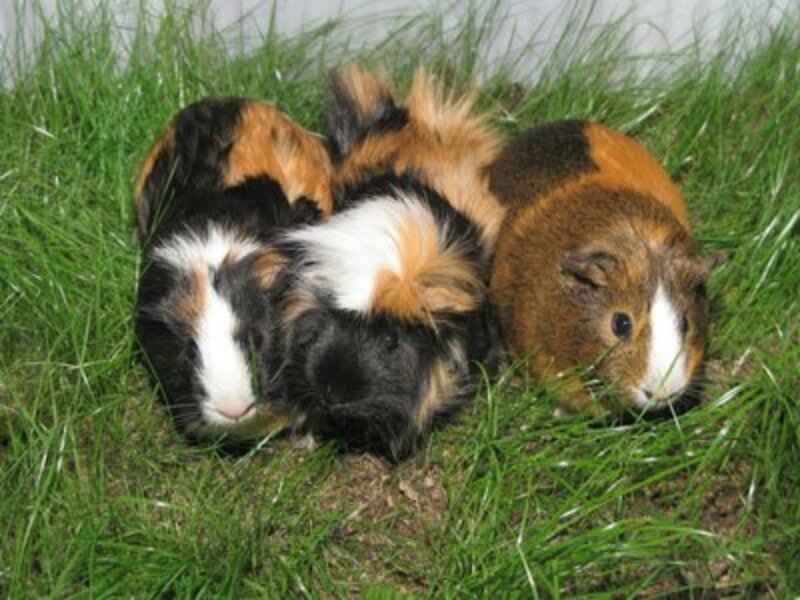 Other types, such as orchard grass, can be offered occasionally as treats and alfalfa may be suitable for growing or pregnant guinea pigs, but Timothy should be the staple. Like humans, guinea pigs don’t produce vitamin C; therefore it has to come from dietary sources. If you feed your furry companions an appropriate amount of fresh produce and high-quality pellets (most are enhanced with vitamin C), it is possible that your guinea pig will get a sufficient amount, but it’s best to provide a supplement. Supplements are available in the both liquid and tablet form. The liquid, designed to be added to your pet’s water might seem ideal, but vitamin C breaks down in less than a day when placed in water, making it unlikely that your guinea pig will receive the right amount. Using this method also makes it almost impossible to tell how much is actually being consumed. As a result, many vets recommend using vitamin C tablets. Manufacturers of these products suggest that your pets can eat them as treats (though my guinea pigs have all begged to differ), but they can be just as easily crushed and sprinkled over food. Just make sure that you purchase tablets specifically intended for guinea pigs. I give my guinea pig nuts and the veterinarian said that as long as you cut the nuts up it good to give to then and puls it is healthy. How expensive is all this? When you first buy your guinea pig how long does it take to get comfortable in its new cage and start eating and drinking ? I heard that fleece isn’t ok for bedding too. Is it? Do guinea pigs need to bath? Do guinea pigs need a "hutch"? or is this just optional and would be better for the critter? 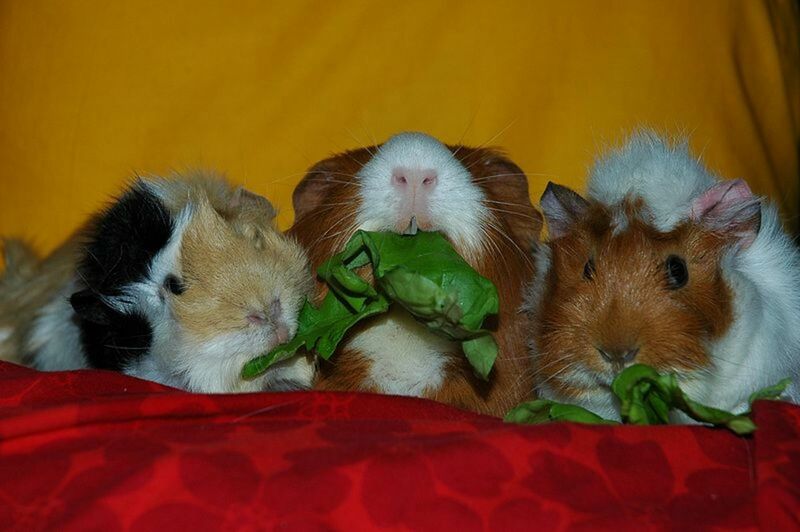 i have three very happy guinea pigs but one seems left out, what can i do?? Thank you!!! This really helped!!! what do I need to own guinea pigs ? I had 2 when I was little now I don't know what I need I already have a cage and a massive run with bedding and hay. what else do I need? So many people are getting just one piggy. They should get two! Imagine if you lives your whole life alone! It's the same for guinea pigs! How can I get a guinea pigs for myself because now I want one of those. I want a gueina pig but yet trying to convince my family. Does one always have to have a companion to accompany the first Guinea pig? I am doing a report about guinea pigs, I'll get an A plus thanks to this! I get a Guinea pig in about 2 weeks I've been doing so much research . All I've been thinking about is the little piggie waiting for me at the pets store. I got a guinea pig 2 days ago. And the lady from the pet store said his past life was very sad, it got abused... Any advice on how to care for it better ? I am getting a guinea pig soon so my mom asked me to make a list on what we need and this really helped!!! I'm getting it on Sunday! I'm getting a guinea pig on Friday and I'm Super Excited cause its my first ever guinea pig that I got. The sad part is I can only fit one guinea pig in my cage but in January - feburary my brothers going to get a guinea pig but in a seprerate cage. Will My Guinea pig be happy to just play with my brothers guinea pig. Yea well my birthday is December 3 so I got money from both my grandpa and aunt 20$ both then from my moms boyfriend I get 60$ So that's 100$ oh and some time around Christmas a week or two before I get 200$ so I will have plunty and then some left I am getting a Midwest cage and 2 guinea pigs so that's about 80$ for two but around that time it's buy one get one free and the cage is like 40$ and I stil have 200$ left so I will be buying chews,foodbowl,water bottle,hay,aspen bedding,and a couple hutches and nail clippers and baby shampoo and a grooming brush for him or her.i have a Syrian hamster that I rescued now so I know plunty on rodents and other small animals oh and one of my aunts works at a produce shop and she can easily buy me some vegetables!Plus she won't mind there fairly cheap. I really really really want two guinea pigs i just need to get my mom and dad to take me to petsmart or petco i wsnt them so bad!!!!!!! It helps as my daughter wants one or two guinea pigs. Its very understanding and straight forward for a FIRST TIME guinea pig owner. I thoroughly rec a mend this website to 1st time of to 8th time guinea pig owners. Thanks,I'll be gettin' a Piggy (or two) soon,this was very helpful!